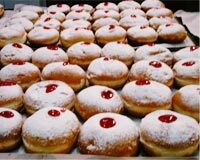 Hanukkah Doughnuts is a very popular recipe. Learn how to make/prepare Hanukkah Dough Nuts by following this easy recipe. Mix all ingredients except oil and sugar in large bowl. Place the doughnuts into oil carefully. Take 1 tbsp at a time. Take out from oil and drain on paper towels. Roll the doughnuts in powdered sugar. Doughnuts are ready to serve.